UK Poker Info (ukpokerinfo.co.uk) recently held its second live tournament with great success. Held in Birmingham on Sunday 2nd July 2006, the event was attended by four invited teams, Bir-mingham, Milton Keynes, Stoke and ‘Ladies in Poker’ who are currently causing a great stir on the poker scene. Play was based around a team format with each team consisting of 10 players, each trying to gain points for an accumulated team total, in an effort to win the largest trophy from the day. Trophies were won for both team and individual performances. A special ‘Masters’ trophy was also up for grabs. The event kicked off at 12 noon with all teams in attendance on the hottest day of the year. The team play element was difficult for some players to adjust to at first, but soon all players understood how to use teammates to good effect. With experienced TV dealers and the best Tournament Director in the UK, Richard Wootton, in control, the competition ran as smoothly as possible. Players started the event with 8,000 chips with team captains starting on 10,000. Team captains, however, had a one-point bounty on their heads which was won by opposing teams if they took out a captain from the tournament. A pre-tournament favourite, Vicky Hughes, of the Ladies in Poker team, fell from the race very early on, losing most chips in the very first hand of the game with Ace-Jack. Dave Glaze, another favourite to make the top three also fell early, losing chips early on that he couldn't recover. Early leaders in the tournament were Tristan Douglas, the eventual winner, and Jim Fryer, both from Team Stoke, who had quickly amassed plenty of chips. Michael Glossop of Milton Keynes was playing extremely well early on, but luck was not on his side on a few noticeable occasions. As play went on, more favourites left the game including John Marlow and Val Morris to leave a final table consisting of three Milton Keynes players, three from Stoke, and one from each of the Ladies in Poker and Birmingham teams. 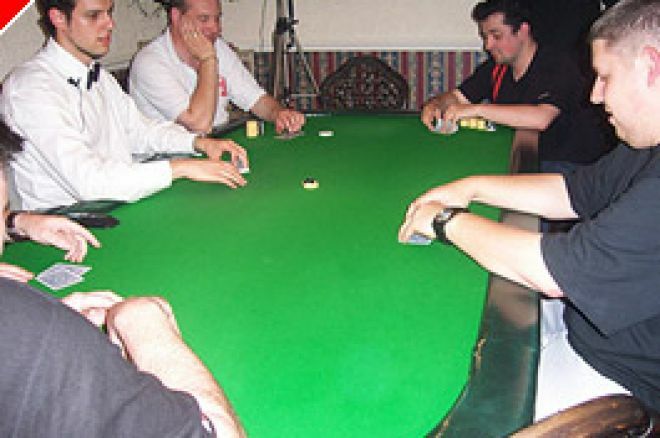 The final table lasted for a mammoth four-and-a-half hours, although the first three casualties in Carol Everton, Carl Hoefkens and Adrian Everton, left early on in the action. Chip leaders at this point were Darren Sutton, Michael Glossop and Tristan Douglas. Some four-and-a-half hours later, the action was down to three players, two from the Stoke team and one from Milton Keynes in Steve Whale. The tournament eventually finished at 12.30am with all players very tired due to the heat of the day and the intensity of the competition. The tournament was a resounding success and many requests for rematches and further team events were requested by all parties. A great, great poker event! Ed note: Download VC Poker for more great tournaments and a whopping $500 bonus!